Diabetes mellitus is a group of metabolic diseases in which there are high blood glucose levels over a prolonged period, and this is also one of the most devastating diseases in the world. As a result, various nutritional concepts have developed in order to categorize our daily diet as healthy food or not. Glycaemic Index and Glycaemic Load are also considered as popular diabetes and other metabolic syndromes related nutritional concepts. However, many people do not have a clear understanding of the difference between Glycaemic Index and Glycaemic Load. The glycaemic index indicates how rapidly a carbohydrate containing food is digested and released as glucose (sugar) into the bloodstream. 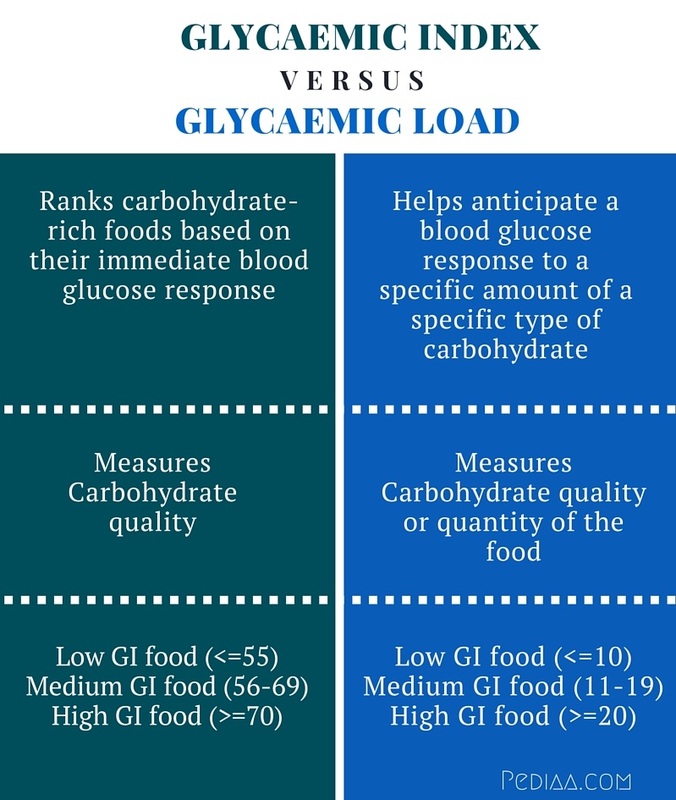 In contrast, glycaemic load is a food ranking system for carbohydrate-rich food that measures the amount of carbohydrates in a serving of food and it is mainly based on the concept of glycaemic index (GI). 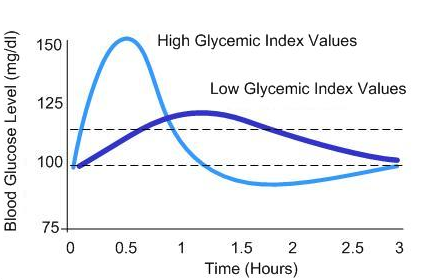 This is the key difference between Glycaemic Index and Glycaemic Load. Glycaemic Index shares some similarities with Glycaemic Load, but they do have some main differences. The glycaemic index (GI) is a numerical value or percentage linked with a particular type of carbohydrate-rich food that indicates the food’s effect on a person’s blood glucose/sugar level. This numerical value range from 0-100 and 100 represents the standard, an equivalent amount of pure glucose. Food can be ranked high on the glycaemic index if it has readily available carbohydrate for quick absorption and increase our blood glucose level. The glycaemic load (GL) of carbohydrate-rich food is a number that measures how much the food will increase an individual’s blood glucose level after consuming it. One unit of glycaemic load equals the effect of eating one gram of glucose. Glycaemic load mainly responsible for how much carbohydrate is in the food and how much each gram of carbohydrate in the food increases our blood glucose/sugar levels. This concept is based on the glycaemic index (GI). In general, it is measured by multiplying the grams of available carbohydrate in the selected food times the food’s GI and then dividing by 100. Glycaemic Index ranks carbohydrate-rich foods based on their immediate blood glucose response. Glycaemic Load helps anticipate a blood glucose response to a specific amount of a specific type of carbohydrate. Glycaemic Index measures Carbohydrate quality. Glycaemic Load measures Carbohydrate quality or quantity of the food. GI = Incremental area under blood glucose response curve (IAUC) for food containing 50 g of available carbohydrate is divided by incremental area under blood glucose response curve (IAUC) for a 50 g of a reference food (usually glucose or white bread) multiplied by 100. In order to measure the glycaemic index of food in vivo method, 10 healthy human subjects will be selected. After 10-12 hrs fasting, their fasting blood glucose level will be recorded. They will ask to consume food containing 50g of available carbohydrate and 50 g of standard food in separate days. Then their blood glucose levels will be measured at 15, 30, 45, 60, 90 and 120 min time intervals. Then Incremental area under blood glucose response curve (IAUC) for a food and standard will be created (Figure 1). Glycaemic Load is calculated using glycaemic index values and serving sizes. The following formula can be used. 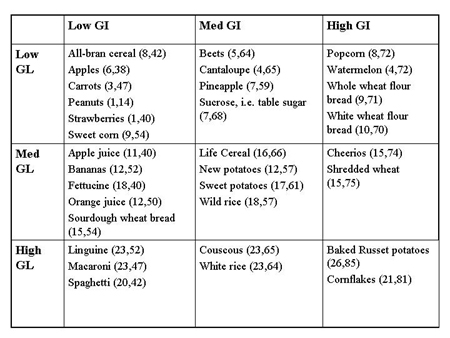 Foods for each glycaemic index and glycaemic load category are given in following figure 2. Krishnan, Supriya; Rosenberg, Lynn; Singer, Martha; Hu, Frank B.; Djoussé, Luc; Cupples, L. Adrienne; Palmer, Julie R. (2007). Glycemic Index, Glycemic Load, and Cereal Fiber Intake and Risk of Type 2 Diabetes in US Black Women. Archives of Internal Medicine 167 (21): 2304–2309. Miller, Janette Brand; Pang, Edna; Bramall, Lindsay (December 1992). Rice: a high or low glycemic index food? (PDF). The American Journal of Clinical Nutrition 56 (6): 1034–1036. Geeshani has a BSc (Hons) degree in Food Science and Technology and Master's degree in Food and Nutrition. She is currently a PhD Student at the Massey Institute of Food Science and Technology. Sharing what she learned is a passion of hers and enjoys writing.